1.Place oven rack in lowest position; preheat oven to 450°. 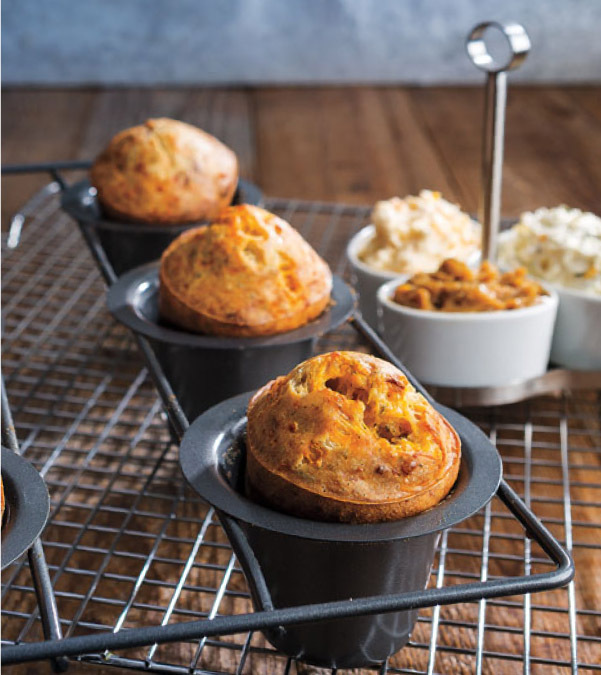 Grease 6 standard popover tin cups with butter. Lightly dust bottom and sides of cups with flour, tapping to evenly coat cups; shake out excess flour. 2.In large bowl, lightly whisk eggs; whisk in milk until frothy. Whisk in bacon, cheese, rosemary, salt, pepper and melted butter until combined. Gradually sift flour into egg mixture, whisking just until combined; do not overmix. Immediately spoon batter into the prepared cups, filling cups about 3/4 full. 3.Bake popovers on bottom rack 15 minutes; reduce temperature to 350°. Bake 15 minutes longer or until popovers are golden brown and sides firm. Serve immediately. > If not serving immediately, poke a small hole in the side of each popover to release some of the steam to retain their shape.